How did it all start- huge data on the web! Huge data had to saved- HDFS was born! How to use this data? 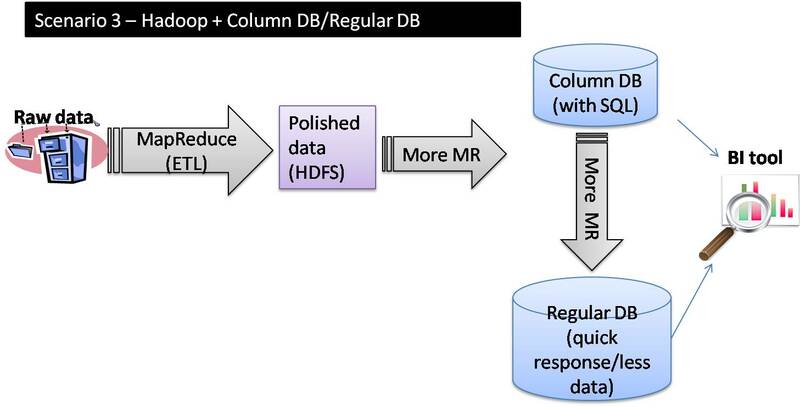 Hiho and sqoop for loading data into HDFS – RDBMS can join the Hadoop band wagon! Would love to hear feedback about this and how to grow it further to add the missing parts! I am pretty excited and looking forward to attend the next HUG meetup on 31st July 2010 in Noida. I really hope to see energetic Indian Hadoop-ers discuss about whats happening in Indian Hadoop community as well as the rest of the world. I guess, I may have been the culprit behind the delay, else we would have the event at least 2-3 months earlier. Will now try to have similar event more frequently. Have already thoughts around planning for one around NoSQL databases again one of my favourites as a technology of the future. Unlike last time in Nov 2009, a group of young Impros- Absolute Zero forum is organizing the event and sparing me lots of pain:). Offcourse, nothing could have been possible without iLabs and Impetus‘ support pushing us to participate in open source community as much as possible. The HUG event this time will have some interesting sessions. Sonal Goyal would be taking about ‘hiho’- an open source solution for bridging the gap between the RDBMS world and Hadoop. As I foresee it, all software based business including SME would like to ride the band wagon of using BI and consumer analytics to enhance business and Hadoop is going to enable that in a cost-effective way. RDBMS would continue to be used for real-time applications since these are time-tested and essentially do not face serious competition (not yet!) from the new age NoSQL databases. So the demand of tools for bringing RDBMS data into Hadoop analytics systems is going to be hot! ‘hiho’ and sqoop are the two top contenders in this category. Hopefully Sonal would be able to share with us the power of hiho as well as pros/cons over sqoop. JAQL talk from Himanshu, IBM would again be interesting to know that people are trying out different approaches than map-reduce java/streaming coding and traditional PIG and Hive high level interfaces. The challenge for Himanshu would be to help us understand how JAQL is better than Hive or PIG. Sajal would be talking about Hive + Intellicus- a window to the unstoppable future of Hadoop in DW and BI. I have always been more biased towards Hive as SQL and java usually go hand in hand in almost all business applications. So it would be interesting to know how Hadoop through Hive is slowly becoming ready for enterprise applications and providing a Visual Interface for data analytics. It seems, at last, Hadoop is ready to come out of developer-only-world to enter the domain of business user$. Talend – Hadoop Support Available from Industry’s Leading Open Source Data Integration Provider . However, Hadoop features will only be in Talend’s Integration Suite and will not, according to a company spokesperson, be available in Talend’s open source core product, Open Studio. The topic is close to my heart since I firmly believe that while Hadoop and Hive are true large data analytics tool, their power is currently limited to use by software programmers. The advent of BI tools in Hadoop/Hive world would certainly bring it closer to the real end users – business users. I am currently not too sure how these BI reporting tools are deciding how much part of the analytics be left in Map reduce and how much in the reporting tool itself- guess it will take time to find the right balance. Chances are that I will find it a bit earlier than others as I am working closely (read here) with Intellicus team to get the changes in Hive JDBC driver for Intellicus’ interoperability with Hive. Have any of you used map reduce in the context of business intelligence? While collating my thoughts on this Linked-in Hadoop discussion, found out that I needed more visuals to explain it first to myself :). Scenario 1: Use Hadoop and Hive as interface to BI tools. Pentaho reporting is already supported as of Hive 0.4.0. Scenario 3: Use Hadoop for intial data polishing, and then dump to a SQL supported column based database near-real BI reporting. In case of Real time reporting, data can further be BI polished from column based databases to a fast regular RDBMS with BI support. Scenario 4: The free way:)- Use Hadoop for intial data polishing, and then dump to a regular SQL database with BI support. The export from HDFS can be the Un-sqoop way. The onus would more be on the developer to dump only ready-for-report data (lesser) with most of the BI already completed as part of More MR step. The important fact to note is that there might be additional costs on moving the major chunk of BI data analysis part to programmatic interfaces (SQL or MR). I am not too much of a database-fallen-in-love type, so do like the way Hive can emerge as a potential BI reporting tool.